The Bitter Southerner looks at the power of Living Walls and #weloveatl to change how people see Atlanta. Back in 2005, the City of Atlanta assembled a team of marketing all-stars: borrowed executives from Georgia-Pacific, Coca-Cola and other corporations, as well as hotshot creative types from the city’s most prominent ad agencies. Three years later — after abandoning the original tagline and replacing it with the even less inspiring “City Lights. Southern Nights.” — Mayor Shirley Franklin finally pulled the plug on Brand Atlanta, citing the budget squeeze brought on by the Great Recession. You’d be hard-pressed to find an advertising pro in Atlanta who would argue seriously that the multimillion-dollar campaign actually made Atlantans love their city more or that it made outsiders more likely to come to the city, either as investors or tourists. The two-and-a-half-minute opening video for the campaign still sits in a lonely corner of YouTube. More than six years after it was posted, it still has less than 8,500 views. Left to right: Photos by Rebekah Gregg, Joe King, Mary Farmer. Fast forward to 2012. It’s an afternoon like any other, and Atlanta photographer Tim Moxley is checking out the #atlanta hashtag on Instagram. So Tim went through his Instagram feed and searched for other Atlanta Instagramers and freelance photographers whose work he appreciated. He reached out to two of them, Aaron Coury and Keith Weaver. They met at a coffee shop and hatched an idea. They would begin tagging photographs of the city with #weloveatl, and they encouraged others to do the same. They hoped to print and assemble the photos they gathered into a gallery show whose proceeds would benefit the Atlanta Community Food Bank. With the help of a fourth partner, Brandon Barr, an executive producer at Atlanta video production company School of Humans, they narrowed the vast collection down to 275 photographs, had prints made and partnered with the Youngblood Gallery in Atlanta’s Poncey-Highland neighborhood. The show’s opening night in December of 2012 drew more than 1,000 people, and it raised $3,271.56 for the Atlanta Community Food Bank. The show also broke down the standard social barriers that keep Atlantans apart. Left to right: #weloveatl's Tim Moxley, Brandon Barr and Aaron Coury. Photos by J.R. Ward II. Moxley says one of #weloveatl’s original “mantras” was the idea of “taking the art from the city streets to the city streets.” So they hit upon an idea: What if they had a mobile gallery — “kind of a food truck for photography,” as Moxley puts it? They found an old bread truck in Macon, Ga., and started a Kickstarter campaign to raise $6,500 to buy it. Within 22 days, the campaign raised $7,536 from 79 backers. Today, barely two years after it was hatched, the #weloveatl Instagram hashtag sits on more than 50,000 photographs, all taken by Atlantans who try to capture in a single image what they love about their city. Images from the #weloveatl Instagram community. From top left, images are by Brandon Barr, Kristin Bowen, Benito Ferro, Matt Gannon, Jeremy Davis, Eduardo Castellon, Benito Ferro, David Carlton, Whitney Ott and Scott Shire. Online engagement is a huge measure of any brand’s success these days, so let’s look at how much engagement Brand Atlanta’s $8 million bought. On YouTube, as of early this week, the “Every Day Is an Opening Day” video had been viewed 8,429 times. Austin’s “The ATL” song had been viewed on YouTube 7,329 times. That’s a grand total of 15,758 views. Divide the $8 million the city spent by that number, and you’ve got a little more than $507 for a single view. Granted, Brand Atlanta’s campaign crossed a variety of media, and social sites did not play the huge role they play today. But still, the return on investment seems ridiculously small. Consider this: The highest ad rates on network television are, of course, for the Super Bowl, in which advertisers in 2014 paid $4 million for a 30-second spot. The game drew a television audience of 111.5 million people this year, which works out to roughly four cents per viewer. But four guys with a good idea and Instagram accounts have assembled more than 50,000 little photographic love letters to Atlanta — at no cost but their time and that bread truck. Although the #weloveatl team has no way to calculate how many times those 50,000 photos have been seen on the Internet, it stands to reason that the number climbs into the hundreds of thousands. And then there’s the bonus: Through more than a dozen shows in galleries and on the truck, #weloveatl has raised enough money for the Atlanta Community Food Bank to supply more than 26,000 meals to the city’s needy. So if you were an advertiser with millions of dollars to spend, whom would you rather hire: Tim, Keith, Aaron & Brandon or Grey Worldwide? Tim Moxley adjusting one of the images in the #weloveatl mobile gallery during an Atlanta Streets Alive event. Each print sold creates 200 meals for those in need. Photo by J.R. Ward II. Of course, no one — especially Tim, Keith, Aaron and Brandon — believes their work can replace the efforts of a big ad agency with big money. That wasn’t their intent, anyway. And as the #weloveatl community has grown, its members find themselves relating to their city in new ways, seeking out neighborhoods they’ve seen only in the #weloveatl Instagram feed, spending more time walking around the city in the hope of capturing a new image. We challenged Tim Moxley, Aaron Coury and Brandon Barr to choose their single favorite photograph from all 50,000 in the #weloveatl Instagram feed. "This one came early on. For me this was the first time where I felt someone was submitting an actually real, personal moment. This is Yancy with his wife on their wedding night. To me it speaks of Atlanta now, the citizens of today where life and love happen without any thought or consideration for the ghosts of the past." "This shot by Wes Quarles (@wesq) is from the first show we did and this gentleman's image has been stuck in my head ever since. I love that this stranger's personality almost pops out of this photo in a way that makes you feel like you know him. I also love the contrast as it creates a moody atmosphere." "My favorite shot from the collection so far is this candid street photo from Jason Travis taken just outside Grant Park during a rainstorm. The texture of the rain, the gesture of their limbs as they squeeze under a Georgia peach box, together in this moment — it tells an amazing story of a fleeting moment." The point here is not to dismiss all taxpayer-funded marketing efforts as useless. That’s far too broad a claim to make. But it has become clear that we live in an age where the people of a city can shape how the world sees their hometown with greater impact and clarity than a high-dollar marketing campaign ever could. This cannot be done, however, with legions of Instagram users alone. The #weloveatl gang’s method is to document the things we love about Atlanta. They are observers. But changing how a city loves itself also requires participants — people who are willing to confront old norms and provoke some change. People like Monica Campana, for instance. Top: Monica Campana standing in front of the Boulevard Tunnel project. Photo by J.R. Ward II. Bottom left to right: New York artist MOMO at work on the Boulevard Tunnel project. Campana taking a photo of the wall painting in action. Sparkling Sun is an apt description not just for the paint color but also for the general feeling you get when discovering one of Living Walls' projects. Bottom row photos by Kristin Bowen. A native of Lima, Peru, who spent her teen years in Orlando, Campana came to Georgia seven years ago on a scholarship to study art at the Savannah College of Art and Design’s Atlanta campus. In 2010, the Congress for New Urbanism convened its annual conference in Atlanta. The CNU calls itself “the leading organization promoting walkable, mixed-use neighborhood development, sustainable communities and healthier living conditions.” Campana found those issues very important — particularly the role that public art plays in making cities better places in which to live. But Campana was upset that the dialogue going on at the CNU was open only to those who could afford several hundred dollars for the registration. So she invited 20 street artists to Atlanta for a weekend. They painted 12 murals around the city’s center. Without asking anyone’s permission. That was how Campana cemented her reputation in the Atlanta art world as a provocateur, and it represented the birth of an Atlanta-based non-profit called Living Walls, which has already become a model for similar projects around the world. Living Walls brings prominent street artists to Atlanta to paint huge murals on building walls all over Atlanta. Scroll left or right. Living Walls gallery photos by John McNicholas. Over the life of the project, almost 100 artists from all over the world have participated. Along Edgewood Avenue alone, from the heart of downtown Atlanta through the Old Fourth Ward neighborhood on the city’s east side, there are more than a dozen Living Walls projects, painted by artists not only from Atlanta, but also from California, France, Peru, Mexico, Italy, Israel and Argentina. Living Walls — whose dozens of projects have challenged Atlantans in exactly the way Doyon describes — appears to have turned Atlanta into the epicenter of a global discussion about the value and purpose of public art. In Living Walls’ wake, similar projects have arisen in several American cities, as well as in Peru and South Africa. 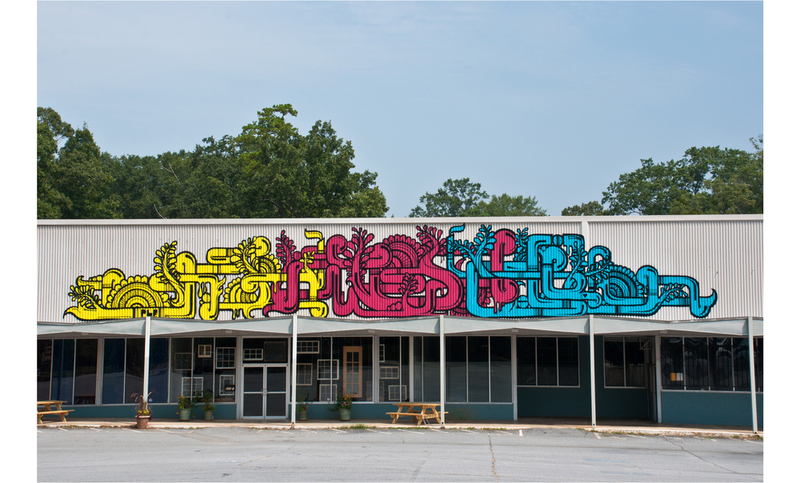 Doubtless, they will all from time to time create controversy, just as Living Walls did in late 2012, when images of a serpent in a work called “An Allegory of the Human City” by French artist Pierre Roti drew the ire of some church-goers in south Atlanta’s downtrodden Pittsburgh neighborhood. But even though the controversy ended with “An Allegory” being painted over, it started a dialogue. Pittsburgh community leader and former state Rep. Douglas Dean, who was among those who worked for the removal of “An Allegory,” later invited the art community to visit Pittsburgh and talk about a new mural. “We need a healing on both sides,” Dean told the Atlanta Journal-Constitution. This mural by the artist Huyro was a Living Walls project caused a bit of controversy. Photo by John McNicholas. As Living Walls has grown, so has its ability to work more straightforwardly with city government. Even though the Pittsburgh controversy resulted in the introduction of an ordinance that would subject street art to greater government scrutiny, Living Walls clearly has its supporters on the Atlanta City Council. "Living Walls has been a great public art partner in the intown Atlanta neighborhoods that I represent,” says Atlanta City Councilman Kwanza Hall, whose district has one of the highest concentrations of Living Walls projects. “The quality of the work has been consistently high. I am proud of the relationship that I have with Living Walls, and the way that we work collaboratively to identify walls that meet the artistic visions of their muralists. 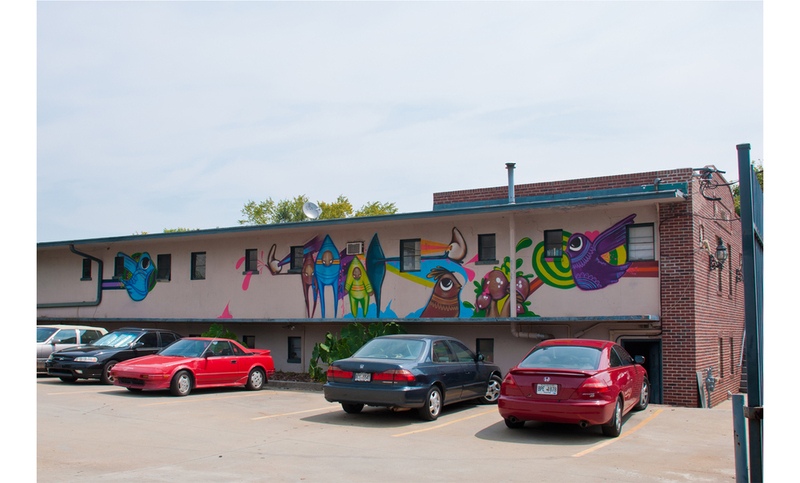 Over the years, I have especially enjoyed introducing longtime property owners to the ways murals can enhance the experience of their property, making it a destination all its own." Cover photo by John McNicholas. Video by Living Walls. 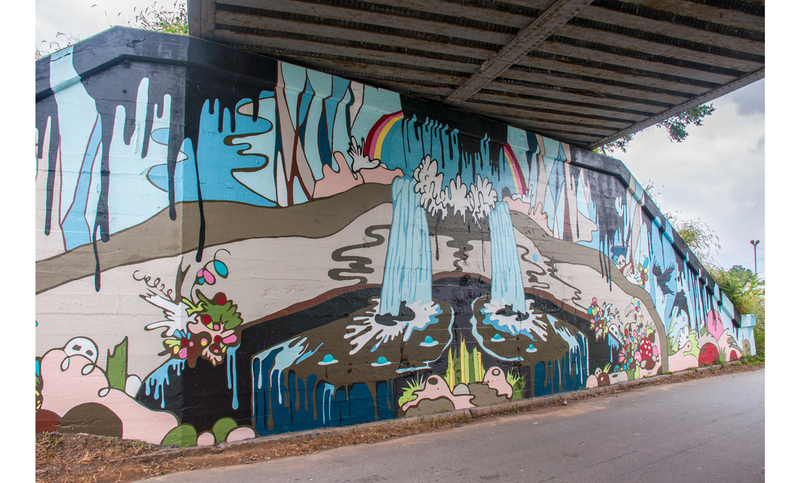 Last weekend, Living Walls and #weloveatl worked together for the first time when Living Walls brought the internationally renowned street artist MOMO to Atlanta to start a two-week project to fill the Boulevard Tunnel with a new mural. As Monica Campana and the Living Walls team gathered with MOMO to begin painting the tunnel, #weloveatl’s Moxley, Barr and Coury led gangs of Instagramers around both neighborhoods to shoot photos of various Living Walls works — and whatever else they saw that made them love Atlanta. Brandon Barr briefs the group on Carroll Street in Cabbagetown before heading out on the tour of neighborhood Living Walls projects. Photo by J.R. Ward II. The Boulevard Tunnel connects two of Atlanta’s burgeoning intown neighborhoods — the Old Fourth Ward and Cabbagetown. The two neighborhoods abut, but they are divided by a railroad gulch that carries freight and MARTA trains alike. You can move from O4W to Cabbagetown only through the Boulevard Tunnel. But historically, the tunnel hasn’t been a particularly welcoming sight. To even the savviest Atlanta dweller, walking through the tunnel from a bar on Edgewood in the Old Fourth Ward to a café on Carroll Street in Cabbagetown would seem more than a little foreboding. The artist MOMO in the Boulevard Tunnel. Photos by J.R. Ward II. But moving through the tunnel over the weekend, watching it begin to fill with the rainbow hues that will form the background of MOMO’s mural, the Boulevard Tunnel was beginning to look like some kind of magical, storybook passageway. It was no longer just a hole through a railroad gulch, a place to hurry through on the way to somewhere else. That old tunnel was becoming, all by itself, worthy of a nice, slow stroll. All around it, young people with hope in their faces seemed completely in love with the old city around them. They snapped pictures by the dozens and tagged them #weloveatl.